The 2018 Voodoo Balanced BBCOR is a two-piece hybrid bat featuring a composite handle attached to an alloy barrel. This combines a lighter swing weight with the alloy barrel that a lot of players prefer for its sound and feel on contact. The composite handle also helps to deaden vibration in the hands. This year’s Voodoo Balanced incorporated some of DeMarini’s classic colors in a modern way. The base of the bat is black and is overlapped by swaths of maroon and bronze-orange. The entire bat is covered in a glossy finish that makes the bat shine. The handle is gloss black and is covered by a matte black grip. This year’s DeMarini stock grip is one of the best we’ve seen on a metal bat. The grip is on the thicker side and is very firm. This firmness makes it feel a little different than most, but we thought that it worked really well, especially with batting gloves. The knob is a cool invention by DeMarini called the RCK knob. It’s shaped differently in order to fit better with your bottom hand. We loved it, as it made the bat really comfortable to swing in addition to helping prevent injury to your bottom hand. The handle has a good taper up into the knob. DeMarini did a great job of maximizing comfort with their grip and handle. In case you couldn’t tell from the name, the 2018 Voodoo Balanced has a balanced swing weight. It feels a bit lighter than the 2017 model because of the new lightweight 3Fusion endcap. While DeMarini lightened it a bit, it won’t be the lightest bat you pick up because of the heavier alloy barrel. This barrel is large and tapers sharply to the handle. We actually feel that this higher weight is a good thing because it offers a good feel of where the barrel is. In addition, most players who swing the Voodoo are looking for a bat that feels more similar to a one-piece alloy. This slight weight increase helps the Voodoo to accomplish that. The 2018 Voodoo Balanced put on a show in testing. The hybrid line has been incredibly popular throughout the BBCOR era for good reason and this years model certainly lives up to expectations. It features a large alloy barrel that is fairly stiff through contact, especially when compared to two-piece composites. In addition to being stiffer, the alloy barrel gives off a crisp ping. The new 3Fusion composite handle does its job and kills most of the vibration in your hands. You’re still going to get some vibration on mishits but it’s really toned down when compared to one-pieces. This feature has made the Voodoo very popular for high-level hitters, as you still get the valuable feedback on mishits without the sharp sting than you would get with a one-piece alloy. 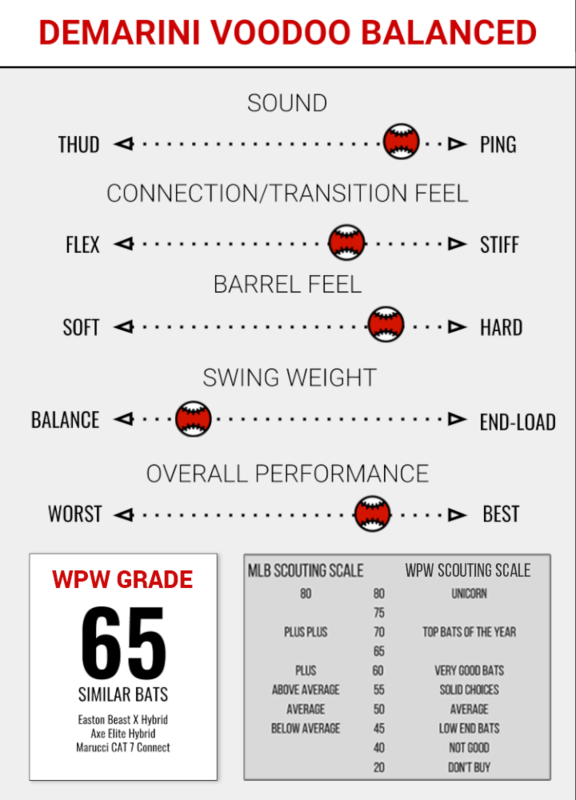 Overall, the 2018 Voodoo Balanced is a high-performing bat that will be very popular in high school and college baseball. DeMarini hasn’t changed much on this year’s model, but why fix what isn’t broken? If you’ve loved a Voodoo in the past, you’re going to enjoy swinging the 2018 Voodoo Balanced.